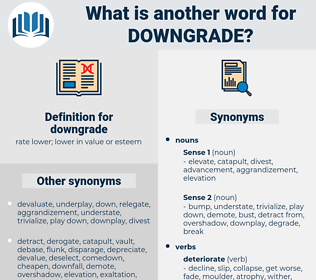 What is another word for downgrade? take down a peg or two. addition, rake, pitch, hill, uprise, increase, flourishing, uphill, gain, lean, increment, boost, renewal, addendum, restoration, accrual, upswing, supplement, heightening, flowering, blossoming, augmentation, tilt, Glacis, accretion, revitalization. cherish, enlarge, commend, approve, overvalue, mend, exalt, compliment, raise, overrate, fix, promote, laud. diatomaceous earth, dinocerate, dunkard, democrat, denigrate, dinocerata, donkey cart. rank, place, range, grade, order, rate.